In Fine FIRE you can create your BIM project in 2D or 3D using very simple 2D commands very familiar to any CAD user like polylines, trim, extend, entity snaps, copy... Fine FIRE combines a state-of-the-art BIM technology and an AutoCAD-like look and feel to help you to draw your project and networks faster and easier. Fine FIRE includes all the tools you need to draw the building in 2D or 3D but if you don't need it you can simply insert a 2D DWG drawing of the floor plan to use it as a background and focus on the fire fighting installation. You can also use our CAD features to quickly draw some walls. If you feel like drawing the building in 3D you simply need to focus on floor plans using the intelligent and parametric objects of the AutoBLD menu. You can define walls, openings, slabs, stairs and more with just a few clicks and Fine FIRE will build the 3D for you. A simple double-click on any object will display its properties for modification. 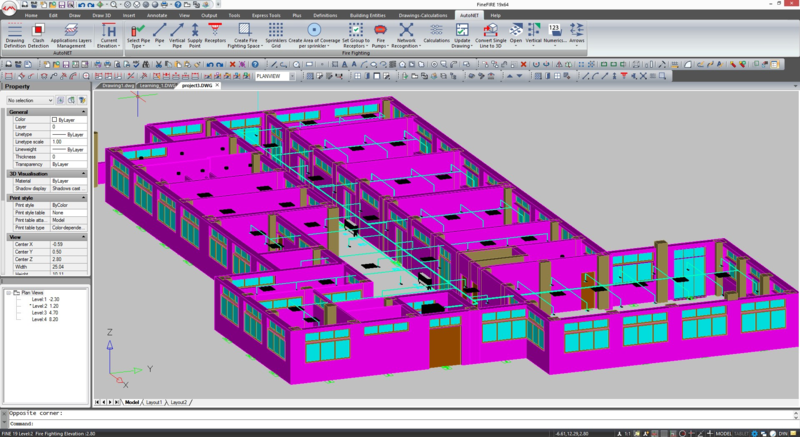 You have all the required tools to create or modify the BIM model without using any other external software. Unlike other BIM Fire Fighting Software, Fine FIRE is producing files directly in DWG and includes features to convert the sophisticated BIM objects that can't be seen in CAD software into simple vectors that can be further edited in AutoCAD®. Sharing 2D or 3D files with other professionals is therefore much easier. This Fire Fighting Software includes all the features of 4MCAD , our alternative to AutoCAD®. 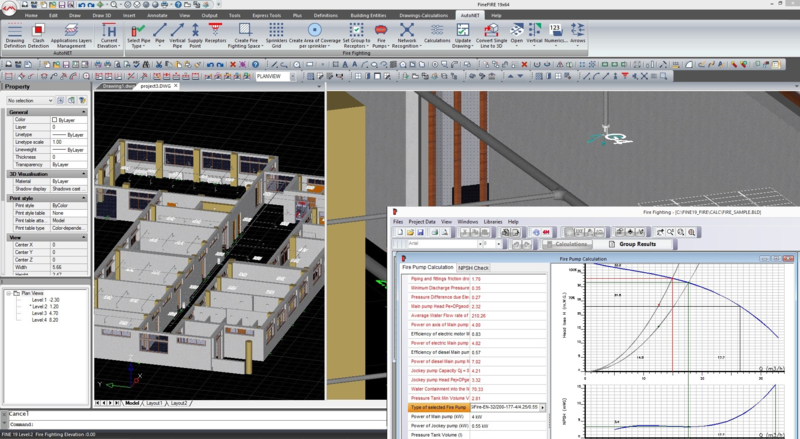 You get 2 software in one, your can keep using CAD to edit some DWG drawings while using our BIM technology to increase your productivity when working on most of your projects. At least you can feel safe and migrate to BIM at your own pace. 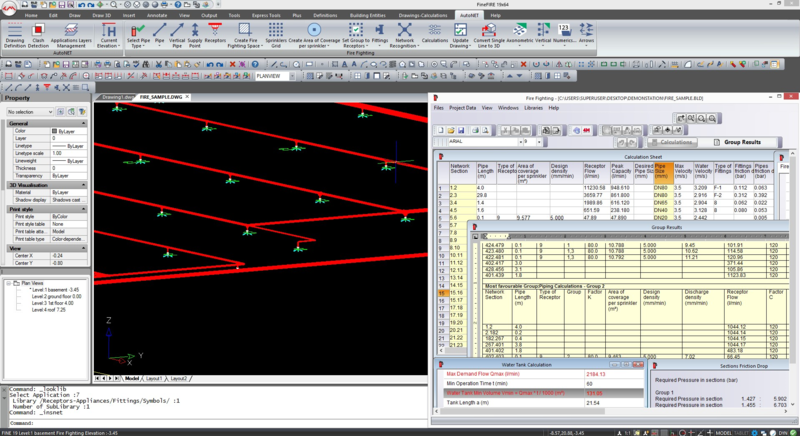 Unlike in other BIM software, Fine FIRE's modern BIM technology does not come at the expense of speed, it is just the opposite: you just need to draw a few single lines and the software will do the rest. Fine FIRE includes extensive libraries of sprinklers, fire hose receptors, pipes, fittings and any other equipment necessary to define the fire fighting network. All these libraries can also be extended by the user who can change the symbols and add more components. Pipes can be drawn with simple commands (just polylines) but you can also take advantage of some expert routing commands like "Pipes Parallel to Wall" or "automatically connected to the sprinklers" to speed up the process. Fine FIRE will also help you to create automatically the legend of your symbols and of course to generate all the technical drawings like the vertical diagrams of your fire fighting installations. Fine FIRE's Calculation module is closely interacting with the installation drawing. Calculations are performed following the widely accepted NFPA 13 standard or the EN 12845 standard. The calculation Component (Fire Fighting) is automatically updated from the installation drawings through the AutoNET group of commands. The pipe networks are recognized and transferred into the calculation sheets. Calculations rely on a rich Methodological background, based on International, American (NFPA 13) and European standards (EN 12845). You may also modify these data if you want for example to anticipate a future extension of the network. Besides the piping calculations, Fine FIRE calculates all the necessary equipment (i.e. Pressure assembly, tank volume etc), as well as the bill of the materials, technical descriptions/specifications and other results. An alternative way to get the calculations is by using the intelligent Fine FIRE wizard. The user describes the Fire Fighting installations in a visual way, through the existing templates (slides) and then the wizard generates the vertical diagram plus the results of the calculations. 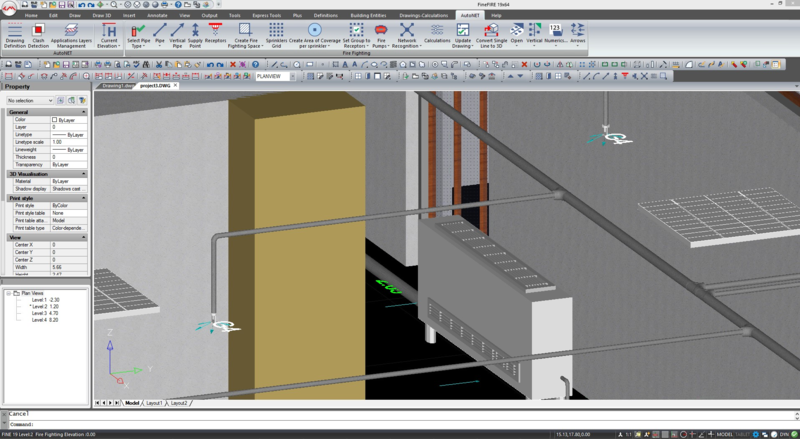 Our MEP Software will generate for you the vertical diagrams of your fire fighting installation network in DWG drawings you can further modify and/or share. Fine FIRE will generate a document with the calculation results and the bill of materials describing the quantities of each of the elements required to build the installation. The template of this document can be customized and you can chose which results you want to display. Fine FIRE's advanced BIM technology will increase your productivity. Using our smart 3D modelers and libraries of 3D BIM objects for piping design you will be able to draw the building much faster and easier. The close interaction of our Calculation module with the BIM model will help you to make all the calculations of your fire fighting installation network directly from the model. Fine FIRE will simply read the project drawing to understand the project, the properties of the network, proceed to calculations and finally update the drawings with the results. The BIM information can also be extracted to create a Bill of Materials showing the quantities and details of the various elements you created in the fire fighting systems. You can calculate the cost and get a detailed description of the elements and fittings you need.